In the end of 2007 I finally got tired of not being able to print photographs in–house, bit the bullet and became a proud owner of an Epson Stylus Pro 4880 inkjet printer. As you are most likely aware, there currently are three major players in the domain of pro–grade inkjet printers, namely Epson, Canon and HP. Choosing one particular printer model is not an easy task and I thought I would first share with you how my selection process unfolded. To begin with I decided that I wanted a 17–inch printer. In my opinion, 17–inch printers represent the best balance between maximum print size, cost and the size of printers. 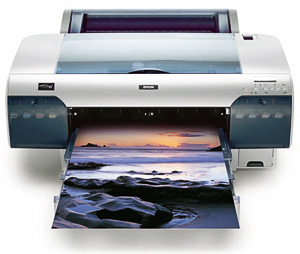 As of early 2008 HP do not offer 17–inch printers and my options thus were narrowed down to the Epson 3800, Epson 4880 and Canon iPF5100. All three printers have been reported to deliver equally outstanding (albeit slightly different if prints are compared side–by–side) print quality. Online reports generally suggest that Canon printers are very competent performers and even have advantages over Epson printers in some areas. The biggest drawback of the Epson 4880 compared to the Canon iPF5100 is the well–known and much–talked–about matter of wasteful ink swapping. In short, the 4880 uses one slot for both photo black ink (used to print on glossy and semi–gloss papers) and matte black ink (used to print on matte papers) and swapping the ink cartridges flushes a considerable amount of ink down the loo. The predecessor of the 4880, the 4800, purges all eight ink lines and thus squanders about USD70 worth of ink; the 4880 is said to waste less ink but this, nonetheless, remains a problem that has to be addressed. The Epson 3800 has two separate slots for photo and matte black inks and partially solves the problem of wasteful ink swapping. Note, however, that I say "partially"—the two black inks share a single channel to the printer head, which means that the printer still must purge that line of ink before switching. Canon (and HP for that matter) use separate slots and separate lines and are devoid of this inefficiency. This issue, obviously, will be a deal–breaker for photographers who envision equally using both glossy and matte papers. I, however, am primarily a matte kind of guy (for both monitors and papers—just cannot stand the reflections) and, to me personally, this concern is for the most part inconsequential. Another major advantage of the Canon iPF5100 is that printer heads are said to never clog. While this undoubtedly is very valuable from the standpoint of the daily use, a closer examination reveals that this benefit is not absolute as it might come at a cost. Epson and Canon use different technologies—while Epson's printer heads might clog and need occasional cleaning, they nevertheless are permanent; Canon printer heads, on the other hand, use extra nozzles to automatically replace clogged ones and once there are not enough additional nozzles the heads have to be replaced. As you might have guessed, replacing the heads is a very expensive undertaking—to the point that it might be reasonable to buy a new printer instead. There also are several other issues to be considered (for instance, Canon's documentation is reported to be poor and the company does not warrant printer heads) but the bottom line is that none of the printers is best in absolute terms. As Epson printers have been around and leading the market for considerably longer, as well as overall appear to be better–sorted products, I decided to go with one of the company's offerings, i.e. either Epson 3800 or 4880.